It has been my pleasure to write on Lindsay Walsh - the talented designer behind the standing armed label - several times in the past. The first was after viewing her S/S 2012 collection launch at the Waterford Gallery. I was so impressed, I immediately submitted and received approval to tuck an article in the next month's issue of Fame'd - October 2011. Fortunately local photographer Kelly Jill had some beautiful editorial photos ready to go. Next was a series of articles for this blog on 5 up and coming designers to watch. In January 2011 I wrote on Walsh, covering some of the many reasons I felt she would have a long career in Fashion Design. With her successful showing at Eco Fashion Week in April 2012, I wanted to do an update on standing armed's F/W 2012 collection. Somehow this ended up very delayed. As Fame'd has ceased publication and will be going off line in the next few months, I have copied that article at the very bottom for those who are interested. To read the previous blog click here. First I want to talk about the meaning behind the brand's name. For Walsh, standing armed is a reflection on her personal feelings about fashion and what it can offer women in today's world. "It's about the power of clothing to transform. I believe clothing can act as an armour, lending a sense of confidence and empowerment." When looking at the F/W 2012 collection, it is readily apparent this is not armour in the traditional sense. 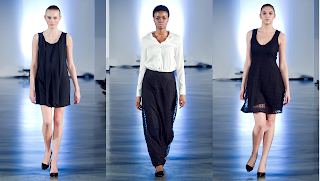 The garments are designed to accent and empower the woman wearing them. 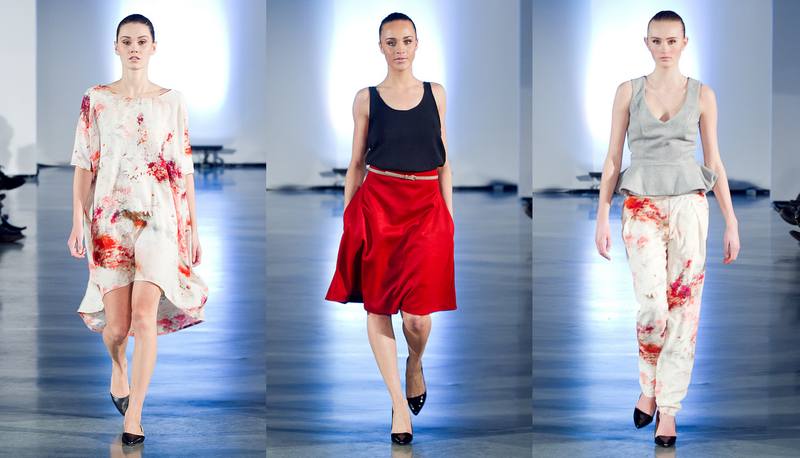 S/S 2012 had the exotic inspiration of Morroco and gypsies. For fall/winter the line moved in a totally new direction - 90's minimalism and fluidity juxtaposed against 50's structure. This is most evident in the silhouettes and fabrics - structured wool garments alongside fluid silks and textural laces. White, gray and black dominate the palette with sparsely inserted accents provided by a vibrant red, warm olive and an understated white/red watercolour print. This is Walsh's most diverse collection to date, thoughtfully created to meet the needs of her busy clientele. "While I design with evening in mind, many of the pieces can carry over from day to night. This is something that adds value for the standing armed customer. She is a woman who needs to transition from a busy day at work to an evening function with ease." Included are 23 pieces - 15 looks - that can mix and match to meet the needs of any occasion. My personal favourite must-have item is the softly draping, slender legged black Format pant. Sewn in a buttery silk, they just exude luxury. Each season has it's surprises. It's an interesting journey from original inspiration, to finding fabrics, to sampling, to the final line. Changes always occur, and sometimes a design conceived at the last minute can end up being a front runner in the collection. F/W 2012 was no exception. Walsh remembers, "I always fully design my collection before going into sampling, but usually end up adding a few styles at the last minute. This season, some of the very last minute additions ended up being the most well received. The moral of the story? Never ignore a feeling. If an idea presents itself, see it out." 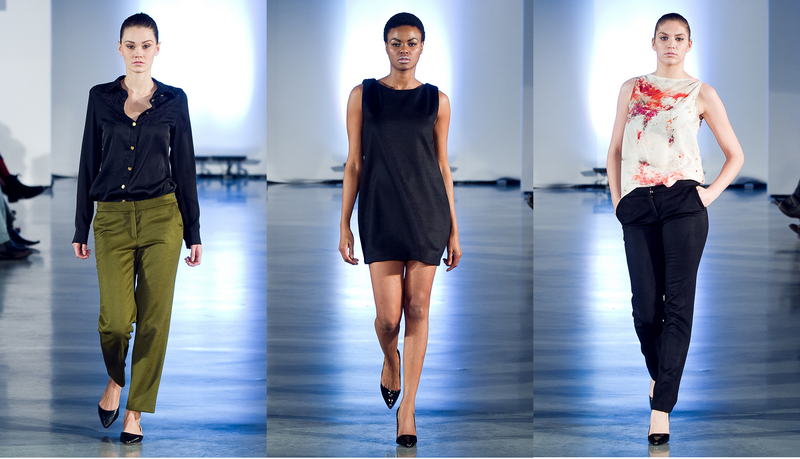 In April 2012, Walsh debuted standing armed's F/W 2012 collection on the runway at Robson Square during Eco Fashion Week. A very positive reception from media a fashion watchers alike validated the direction taken this season. Silhouettes and proportions are strong, there is an easy comfort to the fit that is so important in our West Coast lifestyle and the finely honed palette mean separates will blend easily into most wardrobes. When asked about being a part of EFW she shares with a smile, "Showing at Eco Fashion Week was a great experience. As well, Vancouver is my home, so it continues to be important for me to build the brand on the West Coast. For more information on Lindsay Walsh and standing armed or to shop online, please check out the website here. Walking into The Waterfall Building for the September launch of standing armed's S/S 2012 offering, the first thing you noticed was colour. 16 models were arranged along the walls in a wash of inviting hues including ivory, hot coral, olive and mud. One could almost feel a warm breeze bringing thoughts of the Mediterranean. Designer Lindsay Walsh soon shared her secret. The inspiration was Morocco and her collection captured that essence beautifully. Growing up, Walsh's family enjoyed sports. Winters were spent on ski hills and summers at a lakeside cabin. They also travelled extensively, exposing her to culture and fashion aesthetics from all over the world. In her mid-teens, the move to a new high school saw her focus change from sports to the arts. It was while taking a career prep course she discovered fashion was an option. "It was a turning point for me. I realized I didn't have to do a BA to just check it off the list. Fashion is what I loved." For a year after high school she travelled around the Mediterranean soaking up the culture and then it was back to Canada where she enrolled at Ryerson University. 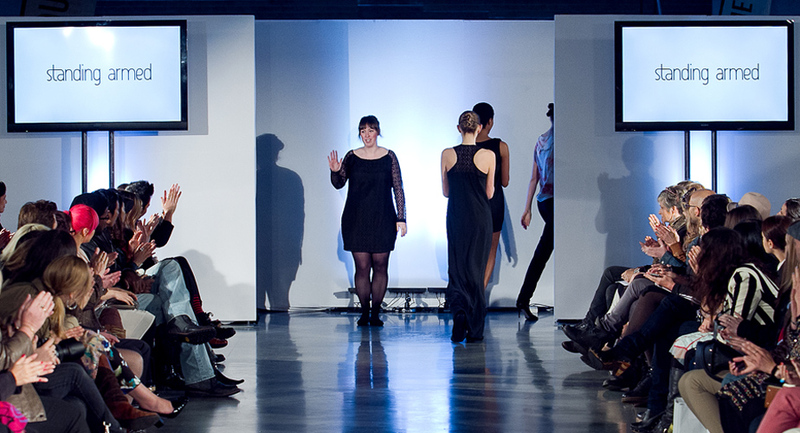 Ryerson's technically demanding four year fashion degree program saw many of the less determined students walk away that first year. Walsh not only persevered, but excelled. In year four she wanted to design a grad collection that both showcased her creativity and challenged her to explore couture skills. The result was a mix of extravagant gowns inspired by palace life in historical Versailles. "I had to stay up all night many nights, but the results were worth it. There was a lot of hand beading and quilting plus really luxurious fabrics." Her collection caught the eye of Holt Renfrew and was chosen as one of ten to be displayed in store windows. Travelling again beckoned. This time it was Australia followed by a year and a half in England - the perfect jumping point to explore from. Morocco became an instant favourite. "Morocco was just different. I loved the markets - the combination of all the textures and prints created almost an overload on the senses." Then it was back to Vancouver where she settled into a job at lululemon while the dream to create her own line continued to simmer. It all began in 2009 with the decision to do a name search. Next? Where would the raw materials come from and who would sew the garments? Everything snowballed from there until the launch of standing arm's first mini collection for F/W 2011. "I knew I wanted the collection really small until I had the production figured out. It was a line of classic dresses inspired by the cocktail hour." Walsh loved the freedom and creativity of owning her own business, so there was no turning back. 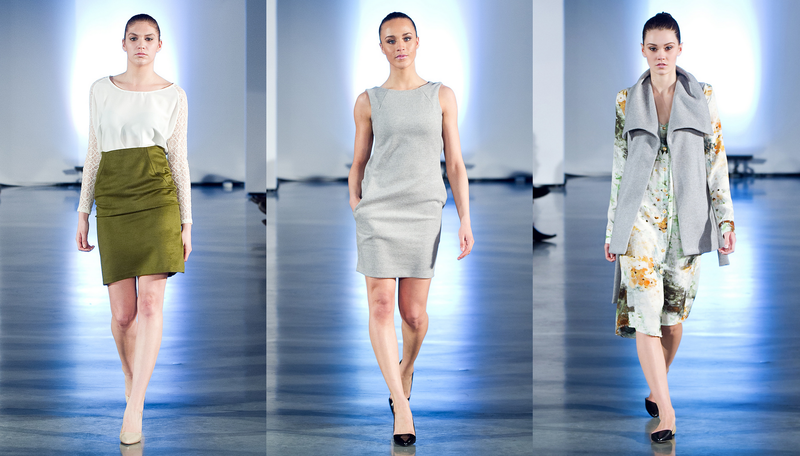 The creation of Spring/Summer 2012 came about via a very organic journey. There were travel photos from her time in the Mediterranean and an old Gypsy Caravan photo shoot by Kate Moss she stumbled upon. Then came the unexpected discovery of mud-dyed silks and a white cotton lace in the Telio showroom to compliment the Thai Silk already incorporated These separate influences all lead to the final garments that in Walsh's own words are of "...elegance and ease. Inspired by Moroccan markets and gypsy culture; rich colours, prints and textures are contrasted against stark ivory. The result is a collection perfect for any urban landscape." For more information or the new e-Commerce store, please visit her website at www.standingarmed.com.